As I was lying on the couch, acutely aware of where my trochanter protrudes on my femur. I thought: ‘I should write my little friends (you!) a note about bursitis’. I have had some flare ups with the ol’ ‘B’ word but I can generally keep the pain pretty short-lived because I know what to stay away from. And if you have bursitis, I think you should know, too! How do you squish the bursa? The bursa is easily squished when you externally rotate the thigh or repeatedly rub the trochanter against the bursa once inflamed. External rotation crams the greater trochanter against the bursa squeezing the life out of it. That’s fine when the bursa is happy but when it’s not happy you need to avoid squishing, smushing and otherwise irritating the bursa. Here are some things you can do to avoid externally rotating the thigh. Don’t cross your legs with one ankle dropped over the opposite knee. 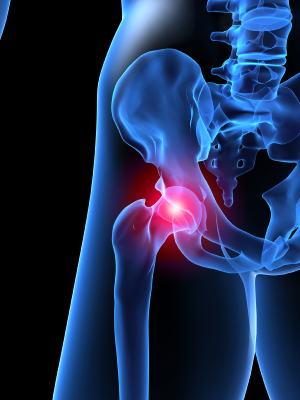 Perform exercises that internally rotate the hip. Lie on your back, feet hip-width apart and push the knees towards each other. You can do an isometric push here. Sleep on your back with your ankles crossed and knees rotated inward. Okay, so you might not last the entire night that way but it is a great way to get off that bursa! Do not move the leg to the side of your body past the hip bone. (No hip abduction for the professionals…) You will have to adopt a demur lady-like position in everything you do until the pain subsides. If you are really flared up you’ll get discomfort with walking for a period of time or otherwise moving the trochanter against the bursa. If you are doing something that hurts, I would recommend not doing that. Does this make sense? Each and every time you externally rotate the thigh or carry the thigh to the outside of the body you ‘smush’ the bursa. Since the bursa is inflamed that kind of motion is only going to tick it off further. So…you’ll get relief extremely quickly if you can just remember to STOP SMUSHING THE BURSA.